Our custom designed poster was lovingly created by Kristen Perry, renowned graphic artist (and adoptive parent!) 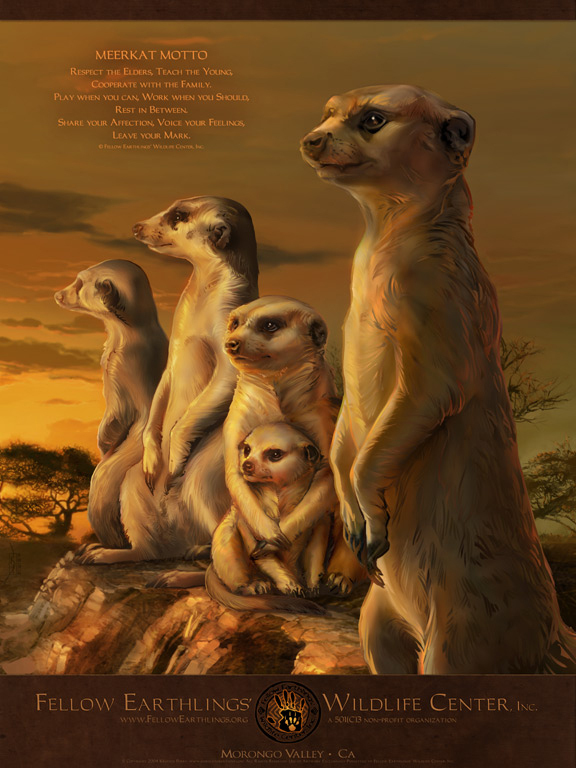 Using our own endearing meerkats as models, the poster evokes the sweeping sights and vibrant colors of southern Africa's Kalahari Desert, the native habitat of meerkats. A small meerkat "mob" is meticulously depicted enjoying the last glowing light of the African sunset while The Meerkat Motto, nestled in the upper corner of the poster, reminds us of the characteristics we so love and admire about these magical little animals. ...or pay by check or money order. Our T-shirt was designed exclusively for Fellow Earthlings' Wildlife Center, a 501(C)3 non-profit organization, by internationally known wildlife artist Heather Lara. (See graphic below.) It is natural colored and made of 100% pre-shrunk heavyweight cotton. 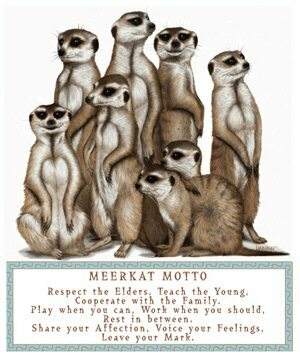 Meerkat Motto © Fellow Earthlings' Wildlife Center, Inc. YOUTH: S, M, L M 38"-40" S (6-8) 25"-27"
ADULT: M, L, XL L 42"-44" M (10-12) 28"-30"
XL 46"-48" L (14-16) 32"-33"